I stumbled on this adaptation when I was about half way through The Moonstone. I finally watched it about a week ago and, as much as it was satisfying to see the novel come alive on TV, I was left feeling a bit unimpressed. I think the characters were written really well and remained close to the book. Clack could have been a little more wheedling and Rosanna was played a tad wimpish (I thought she was anything but a wimp in the novel) but other than that I think they were all more or less spot on. Greg Wise as Franklin Blake had wonderfully flowing hair and was hilarious in the opium state. Keeley Hawes as Rachel Verinder was suitably stroppy and she said 'Clack' exactly as I imagined, but I do think her love for Franklin was hammed up a little (kissing his opium tainted glass etc.). The real challenge was Betteredge and I think they succeeded in staying true to Wilkie's original. There was not a single reference to Robinson Crusoe (they were sorely missed, I tell you), but his relationship with the other servants was brilliant to watch. I think that having just read the novel makes the accuracy of the story a low priority and my enjoyment was certainly not reliant on it. It was a two hour adaptation of a 500 page novel - they had no chance in hell of getting it all in there. Good effort made all round, though. It feels very quick because everything that is slowly revealed in the book (via various tangeants in Betteredge's case), is revealed at top speed. Needs must I suppose. 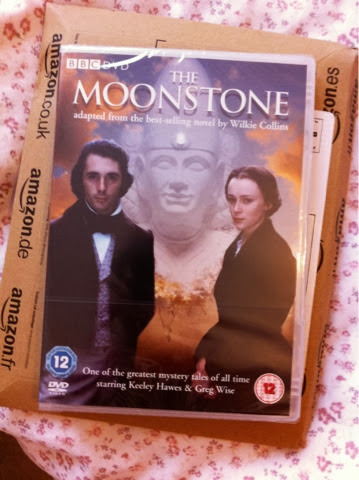 Still, if you're suffering from the post-Wilkie slump that I have been then I'd recommend watching this for a slightly different dose of The Moonstone. Bottom line: worth a watch, just don't go mad for it. Do any of you lovely #readWilkie participants want to watch this? I'd like to pass it on to you guys to watch...let me know! How can you adapt "The Moonstone" without a single "Robinson Crusoe" reference? Mind-boggling. Completely mind-boggling! He is often pictured sitting with a pipe and reading so I was taking that as a nod to his Crusoe-love. For some reason, this has never been released in Australia, which makes me a little bit sad. But given the lack of Robinson Crusoe references, perhaps it's for the best. That is a little bit sad! Even without the references, it is still worth a watch. If only to see how it works on screen. Yes, I think Keeley Hawes WAS contractually obliged to appear in every adaptation. I like her a lot but her face does turn up EVERYWHERE. PS I would maybe like to see it (or well, definitely), but I don't want to cause you a huge postage fee, so if you want to pass it on and no-one from UK shows interest then MAYBE. It is a shame because it is such a huge part of the book. I guess that they just saw it as unnecessary as it didn't actually further the plot, just aided characterisation. The Clack scene was brilliant! I did have a little chuckle to myself. No Robinson Crusoe? Oh no! But... didn't Rachel actually kiss the opium-tainted glass in the novel as well? I'm sure I remember her doing that! I suspect she did (I have no head for details) but it was the giggling way in which Keeley Hawes did it that made it even more over-the-top romantic. For me, anyway. But then, I don't really have a romantic bone in my body! Good old YouTube! He was certainly a fox in his younger days, particularly with his flowing, think, lustrous hair. You'll have to let me know what you think of it.